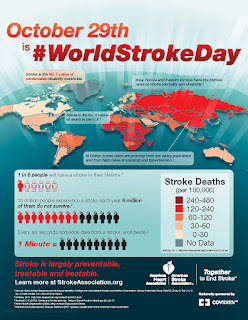 One out of Six people will suffer a Stroke during their lifetime! That's a pretty scary statement, but one that can become even more alarming without a day like today. The 29th October is the day observed worldwide as the World Stroke Day, it was established 9 years go by the World Stroke Organization to underscore the seriousness and high rates of the disease worldwide, raise awareness on the prevention and treatment of the condition and ensure better care and support for survivors. This year, the World Stroke Organization is introducing a new slogan for this important health observance: “Because I care…” This theme reminds us that caring about ourselves, our families, and our friends is the key to preventing strokes and to helping those who experience a stroke. A Stroke or Cerebrovascular accident is caused by an interruption in the blood supply to the brain resulting either from the bursting of a blood vessel or the blockage of a vessel by a clot. The major symptoms include a sudden weakness of usually one side of the face, arm or leg (could involve all at once), numbness, confusion, difficulty speaking or understanding speech; it could also cause a difficulty seeing with one or both eyes; difficulty walking, dizziness, loss of balance or coordination; severe headache with no known cause; vomiting; fainting or unconsciousness. 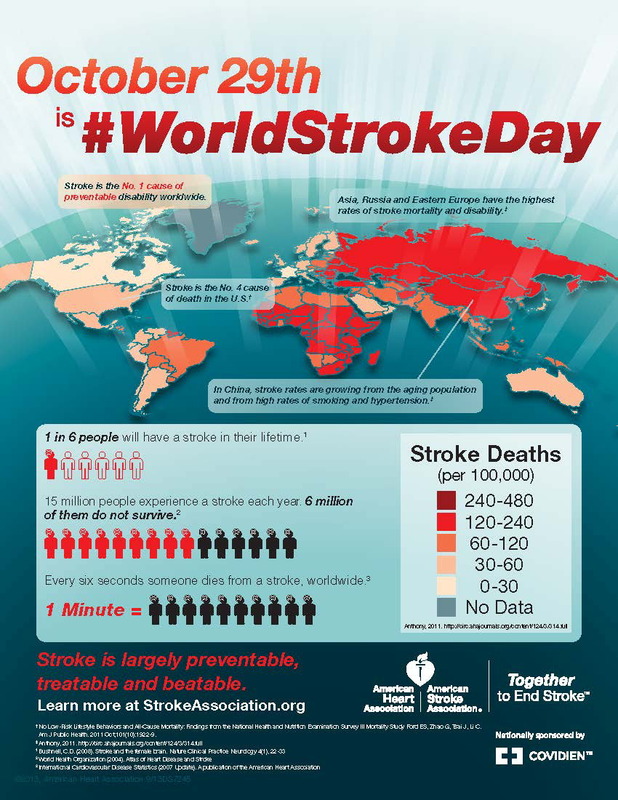 The Slogan for this year's World Stroke Day seeks to emphasize the fact that the condition is preventable. One of the best ways to help save lives from stroke is to know what a stroke looks like (see common symptoms above) . 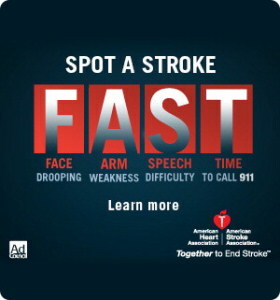 Learning about stroke can help you act fast to save a co-worker, friend, or relative. Although stroke risk increases with age, strokes can—and do—occur at any age. Stay Healthy...See you next year...Oct 29, 2016! A homeless Indian man who had been pronounced dead woke up on an autopsy table, shocking hospital staff who were about to begin a post-mortem, authorities said Tuesday. Police in Mumbai said they found the man, who has not been named, unconscious and suffering from multiple infections on Sunday morning and took him to the local hospital. A doctor at the Lokmanya Tilak Municipal General Hospital certified the man as dead and sent the body for autopsy, Ashok Dudhe, Mumbai Police deputy commissioner told AFP. "As the autopsy was about to begin, the man awoke triggering chaos after which the doctors rushed to the room. Then they snatched the death certificate from my staff and tore it up," Dudhe said. The Dean of the Hospital, Dr Suleman Merchant said the police forced the error by asking doctors to examine the man on the road outside the hospital, because they were busy with security arrangements for a visit by Prime Minister Narendra Modi. "They forced my doctor to examine the patient on the roadside as they wanted to rush back to the prime minister's security duty," Merchant said. "Had the police allowed my staff to take the man indoors, they might have been able to do a better job," he said. The man is being treated in the hospital for severe malnutrition, suspected alcoholism and substance abuse, Merchant said. "He is delirious still and we are trying to stabilise him. Let's hope the damage from his past can be tackled," the dean said. Police officer Dudhe called the suggestion police were responsible for the mix-up "ridiculous" and said the hospital was "trying to cover up their negligence". The police have finished an internal enquiry into the incident and a report has been sent to the commissioner's office, he added. 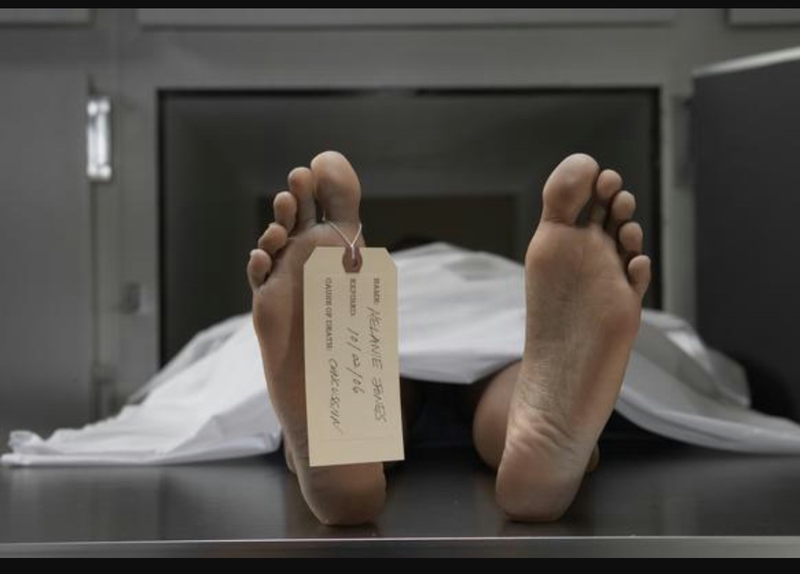 Mumbai's police are regularly faced with unclaimed dead bodies and media reports have suggested mortuaries are running out of space to hold the corpses. 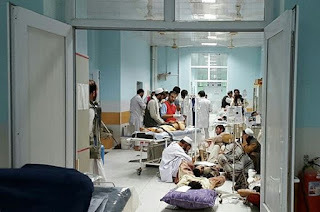 Doctors Without Borders (MSF), whose Kunduz hospital in Afghanistan was hit by a suspected US air strike on Saturday, is one of the largest medical charities in the world, counting more than 36,000 volunteers working in 60 countries. MSF was founded on December 21, 1971 when a team of French medics and journalists, including humanitarian icon Bernard Kouchner, denounced what they described as a genocide in secessionist Biafra, in Nigeria. The non-profit provides emergency medical care in war zones, during epidemics and in the wake of natural disasters, and is a self-governed group of 24 associations worldwide, based in Switzerland. Its stated commitment to caring for patients regardless of race, religion or political affiliation and reputation for working in the toughest of conditions saw it awarded the Nobel Peace Prize in 1999. In 2014, the charity oversaw 384 projects worldwide, 31 percent of which were linked to armed conflict. Operations in Sudan, the Democratic Republic of Congo, Central African Republic, Haiti, Sierra Leone, Afghanistan, Niger, Liberia, Ethiopia and Iraq take up just over half of the organisation's total spending. On its website, MSF says it "rejects the idea that poor people deserve third-rate medical care and strives to provide high-quality care to patients", and is well known for bringing the public's attention to forgotten conflicts through its work. Last year, the organisation treated more than half a million patients in clinics and hospitals across 63 countries, including 2,200 suffering from the Ebola virus. It works to combat the spread of diseases such as malaria, with 2.1 million patients treated last year, as well as HIV and cholera, according to a report by the charity. Another focus is malnutrition. MSF doctors cared for more than 200,000 severely underfed children in 2014. MSF is funded overwhelmingly by a network of 5.7 million private donors, who provided 89 percent of its $1.44 billion budget last year. MSF has inspired a number of imitations -- including Hospitals Without Borders and Reporters Without Borders -- groups which set out to improve hospitals in developing countries and to campaign against ill-treatment of journalists respectively.